Editor’s Note: This review contains some spoilers. An open-world RPG with a niche focus on realism. 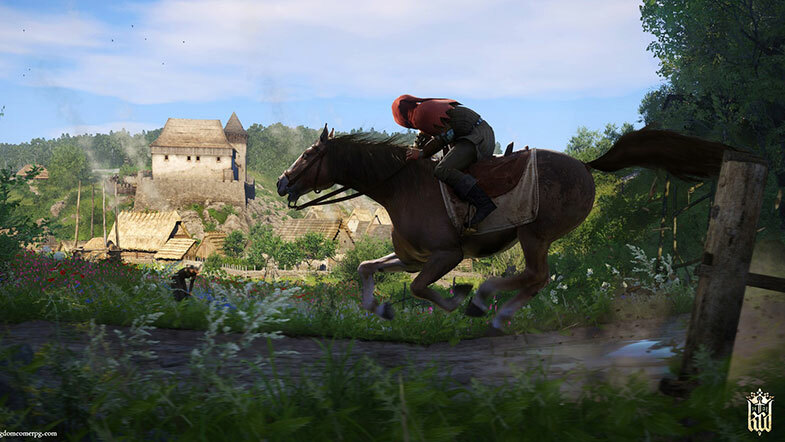 Kingdom Come: Deliverance features a story that is deep and immersive, along with plenty of side quests to keep you busy. Particular aspects, such as the save mechanic, might overshadow what this release does well, but a future patch seeks to remedy this. I didn’t experience any crashes, but other players in the Steam forums have reported experiencing them — frequently, in some cases. Your journey as Henry begins with a conversation with your mother. You’re afforded four dialogue choices, with each choice raising a different stat. A note informs you that if you decide you later regret your decisions here, there’s no reason to worry, as you can raise the stats you didn’t opt for later. During other conversations, you might have the chance to use persuasion to achieve a desired outcome. There are various types of persuasion, ranging from relying on how dangerous you look to how well-dressed you are. You can also try to use force or bribes to get your way. During an invasion of your village, you must find a horse and escape. You have a sword in your possession and shouldn’t feel afraid to use it if you come into contact with enemies who are more than adequately equipped, but attempting to fend off these attackers won’t go well. Ideally, you’ll avoid detection or at least reach a horse before someone executes a cheap attack. Worst-case scenario, you'll face multiple enemies. If one executes a combo on you, your death might soon follow. At least the bandits you face shortly after this section are easy and don’t offer much of a fight. Once you finally manage to reach a horse, a cutscene follows. (I found that the cutscenes help depict how Henry perceives his world. You can skip them, but you cannot pause them when they start.) Afterwards, you must escape mounted enemies with bows. If you die, you likely have to start at the beginning of your run. It doesn’t help that controlling the horse is akin to attempting to control a car on ice — at least, until you gain working familiarity with the controls. To my dismay, there’s no difficulty option in the settings. It’s not too difficult to make money. Weapons and armor are worth quite a bit, and there are plenty of flowers to gather in fields. Finding someone to sell these to is what poses any difficulty. Only traders that sell armor and weaponry will buy those items; likewise with the other traders. You just have to explore a town until you find the right vendor. The original save mechanic permitted you to save only when sleeping in your bed or if you had a pricey Saviour Schnapp to spare. The rationale was likely that it would prevent you from saving, performing risky behavior, then reloading if things didn't go your way. An autosave activated after you progressed some in a quest or started a new one. It was difficult, however, to gauge. The upcoming 1.3 patch permits you to save and exit the game. There are many different skills you can level up, from basic stats, such as vitality, to weapon-specific, to more specialized skills, such alchemy or reading. You might get a sense that this title has a Skyrim-esque vibe due to this and the open-world. You level all skills up by performing relevant actions. At milestones, you gain a point which you can use to learn a perk within that skill. For instance, the perks in the agility stat might increase your dodge rate if you aren’t wearing plate armor, or make you strike faster but deal less damage. There seems to be a downside to a decent number of perks — particularly the ones that you can unlock at earlier levels — but you can test out different builds. Activities such as lockpicking and alchemy feel unintuitive at first. There are helpful tips, but perhaps a visual demonstration would be more instructive. For skills such as hunting, you can pay someone to help you to further your level. I think there should be more opportunities to engage in combat for those who enjoy it. After training, I didn’t come across any bandits for far too long. So unless you want to start fights with innocents or work through quests, you'll be out of luck if you're looking for combat. The most action comes from participating in the story and not wandering around aimlessly. What you find in Kingdom Come: Deliverance that you won’t find in some other open world RPGs is a heavy emphasis on realism. You must keep a watchful eye on your energy and hunger levels, which don’t deplete too quickly, but below certain thresholds your combat will suffer and you might stumble or experience blurred vision. Every day or so, there’s a pot you can eat from that respawns — usually, the pot is in the house you’re staying at. You may also find food lying around or mushrooms in fields, but you need to be careful that you don’t eat food that is rotting. This realism might deter players who prefer to focus more on other, less mundane things. The beginning is rather more difficult than you might anticipate, but once you're far enough into the story the gameplay eases up some. 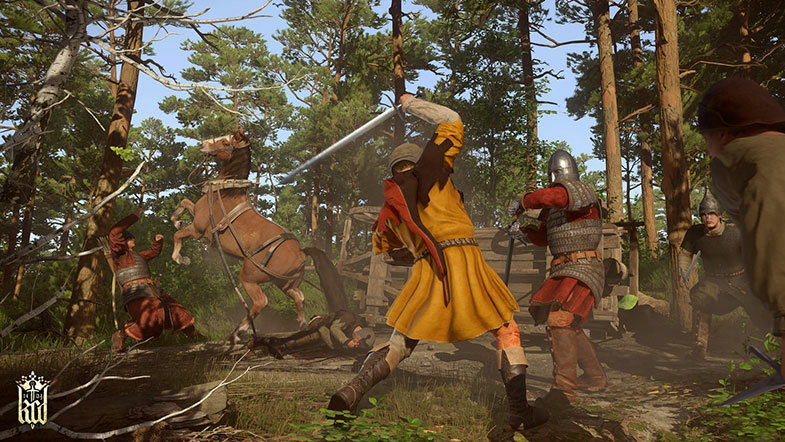 Besides the oddity of the save feature not saving when sleeping, getting hung up on stairs while attempting to scale them, and engaging in dialogue or other actions taking longer than expected, Kingdom Come: Deliverance feels fairly polished. Constantly watching energy and hunger levels might deter a player, although the ascetic perk allows you to go 30% longer without food (but the effects are worse once you do get hungry) and the respawning pot of food and other food you may find makes the nourishment level not as bothersome as it first appears; additionally, you can fast travel, making it easy to find a bed again. This is an RPG for those who enjoy a deep, pronounced story with a focus on realism.